I know for those of you just barely feeling spring trying to force it’s way in, you won’t want to hear about the extreme heat we’ve had in southern California recently. With temperatures in the 90′s, it seems we have skipped right over the spring and jumped right into summer. 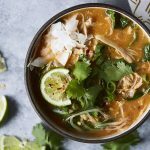 I have switched from comforting winter soups and stews and roasted veggies to salads and cooler meals. 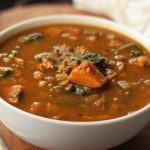 Soup that isn’t served hot may seem strange, but there are times when it just works and this is definitely one of them. It’s super fast to throw together — no slaving over a stove! — you don’t have to wait around for hours to let it simmer and there is very little prep. 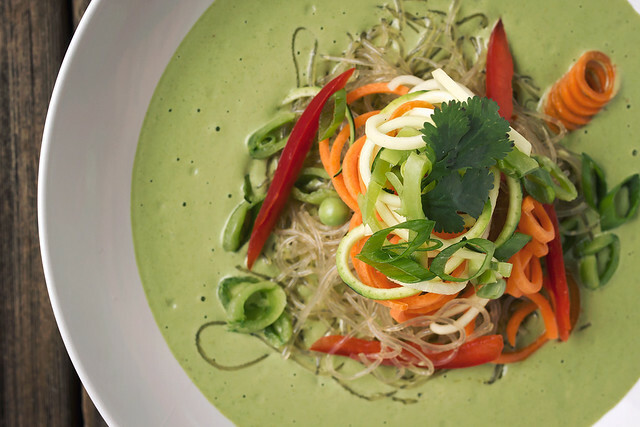 This Chilled Green Curry and Kelp Noodle Bowl is loaded with beautiful spring colors and it’s so wonderfully satisfying and comforting. I am a sucker for any dish that becomes a work of art as soon as it’s plated, loaded with vibrant hues and, of course, healthy and nourishing seasonal ingredients. 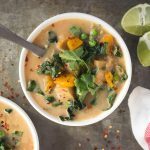 Green curry isn’t as spicy as some of the other curries can be, so you can control the heat level by adding as much jalapeño as you would like, leaving out the seeds or adding them in for more heat. I like spice, so oftentimes I even serve a little sriracha drizzled on top. Serve this noodle bowl with both a fork and a spoon, as both are needed. 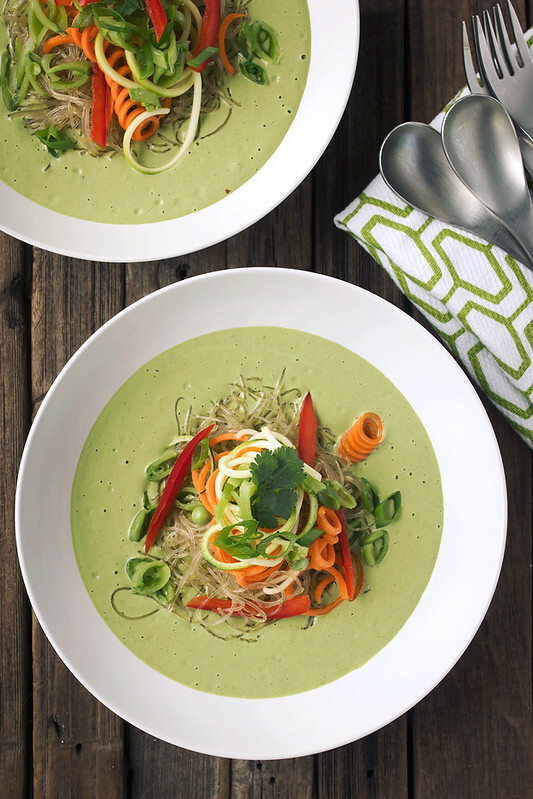 You get the comforts of the creamy broth and the satisfying crunch from the raw veggies. 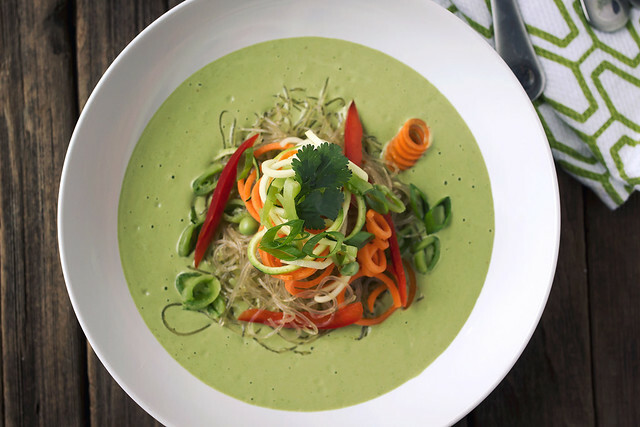 So slurp up those noodles and raw veggies and enjoy every last bit of this vibrant, creamy, rich and healthy dish. Add all of the ingredients, except the water to your high speed blender. Blend until smooth and creamy, slowly adding as much water as you’d like to achieve your desired thickness. Place the broth into the fridge in a tightly covered container and allow to chill while you prep the rest of the soup. Empty the kelp noodles from the bag, drain and rinse well. Soak the noodles in hot water and baking soda for 15 minutes. Drain and rinse well. Add the noodles, oil and red pepper flakes to a bowl, toss it around and massage the oil into the noodles. Allow the noodles to marinate while you prep the veggies. Cut smaller with scissors before serving. To Serve: pour the desired amount of broth into a large serving bowl. 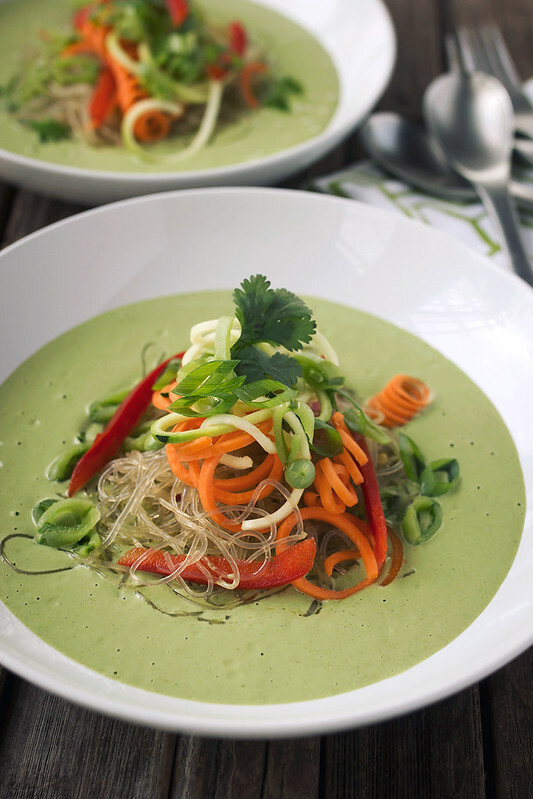 Top with the kelp noodles, veggies and garnish with fresh cilantro, basil or mint, thinly sliced scallions and a squeeze of fresh lime juice. Serve immediately. Feel free to play around with the veggies served on top, I went with what I had on hand and what I thought complimented the flavors best. Opt for other spiralized vegetables or you could thinly slice asparagus or cucumbers instead of the sugar snap peas, etc. 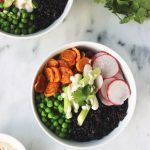 This totally looks like Spring in a bowl!